Persistent attitudes about mathematics as a subject that only some people can master is a significant hurdle for students to overcome, but doing so is key to learning and improving. In this monograph—part of a series that captures practices and tools that support deeper learning for overage and under-credited adolescents at transfer schools across New York City—we share how North Queens Community High School teachers and counselors developed an integrated system of support changing students’ mindsets about math and building their persistence and capacity. From 2012 to 2015, North Queens Community High School was a member of the Transfer School Common Core Institute (TSCCI), an innovative professional development institute led by the NYCDOE’s Office of Postsecondary Readiness. Through coaching provided by TSCCI partners Eskolta and reDesign, North Queens’ principal Winston McCarthy, Program Director Lainey Collins, and a team of teachers, tackled the challenge of building students’ math skills. In a push that brought together teachers and counselors, they established tools and processes to help students recognize their own mindsets and learning styles and then use this understanding to build positive habits, choose good strategies, and challenge themselves. Three years later, their effort had paid off: student passing rates on the statewide math Regents exams had more than doubled, from 31 percent to 70 percent. 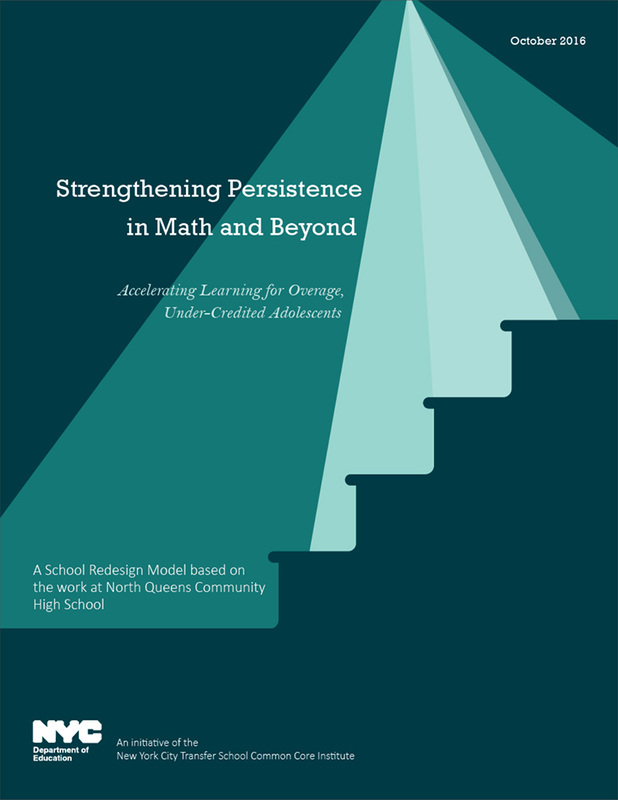 This report outlines the strategies and tools that North Queens’ team developed to build persistence in mathematics. This includes Math Habits of Mind, which are modes of thinking and concrete behaviors that support problem-solving, such as visualizing, pattern detecting, and tinkering; a Productive Persistence Rubric and Conferring Protocol to facilitate ongoing conversations between adults and students about students’ belief in malleable intelligence, their ability to succeed, their sense of belonging, and the extent to which they value a given class.